Holds a Bachelor of Science in Civil Engineering from UFRJ (Federal University of Rio de Janeiro), a Masters in Production Engineering from UFF (Fluminense Federal University) and a Logistics MBA from the COPPEAD Institute (UFRJ). Since February 2016 is the CEO of GRU Airport. In 2011, Gustavo joined Invepar to work with new businesses development. 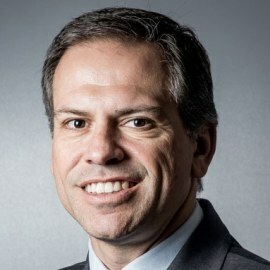 During this period he actively worked on the winning project of São Paulo-Guarulhos International Airport concession, as well on its Master Plan development and the construction of the new Terminal 3. Figueiredo also worked in other companies such as Nimbi and Wilson Sons.